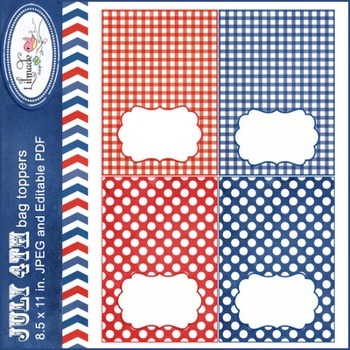 4th of July editable labels, bag toppers set featuring four printable labels you can use as place cards, bag toppers, name labels, gift tags and more. Each label comes with a blank space to add your own text. JPEG sheets at 300 dpi., size 8.5 x 11 inches. Editable PDF file, size 8.5 x 11 inches. There are 4 labels per sheet, each label measures 2.5 x 3.5 in. Use this product to create decorations for your classroom, party décor for events you organize, party decorations you will sell already customized for a particular customer as long as you sell it in printed form. Not to be resold digitally.